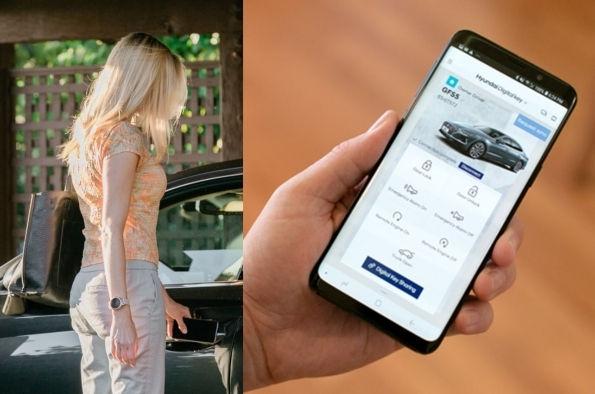 Hyundai’s Digital Key is a downloadable smartphone app that can replace a traditional car key by leveraging Near Field Communication (NFC) to detect an authorized smartphone. An NFC antenna is located in the driver’s door handle for locking and unlocking while a second antenna for starting the engine is located in the wireless charging pad in the center console. Once authorized, the Digital Key allows a smartphone to control select vehicle systems remotely using Bluetooth Low Energy (BLE) communication. A user can lock and unlock the vehicle, activate panic alert and start the engine within a range of about 30 meters of the car. The new Digital Key can be utilized by up to four authorized users, facilitating seamless vehicle sharing. Users’ preferred settings are also stored in the car, meaning that when a user is recognized, the vehicle automatically adjusts settings for side mirrors, radio presets, sound settings, and seat positioning. Hyundai is using Trustonic Application Protection (TAP) to secure the Digital Key. TAP ensures that Digital Key transfer requests are securely displayed to and approved by a real, authenticated user on a trusted device. TAP utilizes a multilayered industry-recognized security approach for communication to and from the customer’s phone. Car owners have a deeper level of access than other authenticated users, enabling them to set vehicle-function permissions and the duration of access for each shared user. This enables uses beyond car sharing, such as enabling couriers to access the trunk within a pre-agreed window of time to deliver a package. Future uses that the app could enable include car rentals, triggering an alarm when a vehicle travels outside a designated area and remote control of features, such as autonomous parking. To learn more about Trustonic solutions for the automotive sector and see how TAP can make your connected and autonomous car apps simpler, faster, and more secure, visit www.trustonic.com/automotive. Trustonic's mission is to embed the best security into the world’s smart devices and apps, empowering mobile and IoT developers to build the trust required to deliver simple, fast and secure solutions. The Trustonic hardware-backed security platform is embedded in more than 1.7 billion devices including those from Samsung, vivo, OPPO, Xiaomi, Motorola and LG. Trustonic’s mobile app protection solutions secure critical apps for banks, FinTechs, payment providers, cryptocurrency platforms, automotive manufacturers, mobile network operators and government bodies including Samsung Pay, Alipay, WeChat Pay and Volkswagen. Trustonic is a venture formed in 2012 by ARM and Gemalto. Visit the Trustonic website to access the solution download ‘Application Protection for Automotive & Connected Car apps’. Hyundai Motor America is focused on delivering an outstanding customer experience grounded in design leadership, engineering excellence and exceptional value in every vehicle we sell. Hyundai’s technology-rich product line up of cars, SUVs and alternative-powered electric and fuel cell vehicles is backed by Hyundai Assurance—our promise to deliver peace of mind to our customers. Hyundai vehicles are sold and serviced through more than 830 dealerships nationwide and the majority sold in the U.S. are built at U.S. manufacturing facilities, including Hyundai Motor Manufacturing Alabama. Hyundai Motor America is headquartered in Fountain Valley, California, and is a subsidiary of Hyundai Motor Company of Korea.